One of the oldest British colonies in the Caribbean, sun-drenched Nevis boasts a mountain of beauty and charm—quite literally, in fact, as Mount Nevis is visible from just about anywhere on the picture-perfect island. Just 36 square miles in size, and located less than 10 minutes away from St. Kitts by boat, the unspoiled beauty of Nevis makes it a blissful destination with much to see and savour, or simply to kick back and relax. Snorkel over vibrantly coloured coral reefs in clear blue waters or take a Pilates class while wild donkeys nosh in nearby meadows. And from boutique hotels with bespoke spa services, to strolling the tranquil grounds of the Botanical Gardens of Nevis, the allure and mystique of this enchanting island are seemingly endless. Get the lay of the land by bicycle, cycling by fragrant mango trees and past mischievous free-range goats to the island’s capital, Charlestown. 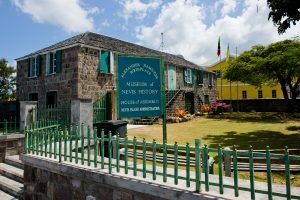 A visit to The Museum of Nevis History reveals this was the birthplace of Alexander Hamilton, one of the United States’ Founding Fathers (and subject of the hit Broadway musical). Set in the Georgian-style building known as Hamilton House, Hamilton was born in 1757 and spent his first eight years here on Nevis. Post-history lesson, ride onwards to Pinney’s Beach,where peddling efforts are rewarded and thirsts quenched with Killer Bee rum punch cocktails sipped seaside at Sunshine’s Beach Bar. Alternately, swap bikes for ATVs and explore the island on- or off-roading with Funky Monkey Tours. If hiking is preferred, plenty of leisurely rainforest trails are waiting to be blazed on and around (dormant) volcanic Mount Nevis. There is also a steep and challenging climb to the peak of Nevis— recommended for serious hikers only. It’s a trek that’s best done with a guide, allowing at least a half day to summit and descend. For those seeking water sports and activities, there are plenty of beaches for relaxing, strolling and swimming, along with calm waters for sailing, standup paddle boarding and kayaking. From reefs to wrecks, over 40 dive sites in warm, clear waters are ready for snorkel and SCUBA enthusiasts to explore underwater worlds and marine life. 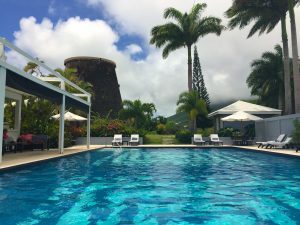 Set 750 feet above the Caribbean Sea in the island’s interior and overlooking Nevis Peak, Montpelier Plantation & Beach is a boutique hideaway set on 60 peaceful acres and just a short walk from the splendid Botanical Gardens of Nevis. It also marks the site where, in 1787, a young British naval officer by the name of Horatio Nelson wed Fanny Nisbet by a silk cotton tree. Steeped in both history and natural beauty. Montpelier Plantation & Beach is built around one of the island’s original 18th century sugar plantations. It features 19 spacious bungalows spread over a lush hillside and offers sweeping sea and mountain vistas. Renowned for its exceeding commitment to privacy for its guests, in 1993, a then recently separated Princess Diana, with sons in tow, stayed here for a time. Now 50 years young, this Relais & Châteaux member property offers warm stone massages in an outdoor setting, cuisine befitting the most ardent of gourmands and activities ranging from tennis and swimming to Pilates and yoga. Accessible by hotel shuttle, private car, ATV or bicycle, Montpelier also has a private beach for guests’ use, complete with private cabanas, outdoor bar and seating area where gourmet picnic lunches are enjoyed. 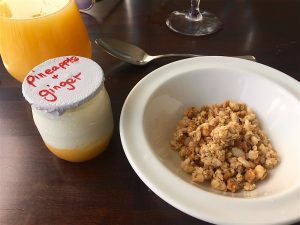 Complimentary breakfast in the courtyard of Montpelier may include homemade yogurt and granola, fresh-baked croissants with local fruit preserves, and egg white omelettes or poached eggs Florentine. Afternoon rum tastings at Indigo Bar showcase spirits distilled throughout rum producing Caribbean islands and Latin American countries, while the resort’s rum punch is so renowned and beloved, its recipe remains a well-guarded secret. Be sure to try one while lounging deck-side by the blue mosaic tiled pool. Pre-dinner cocktailsand canapés are served in the grand, colonial-style Great House, and magnificent sunsets are visible from the terrace of Restaurant 750 (named for Montpelier’s lofty elevation) whilst dining on fresh-caught seafood seasoned with local flavours. For the ultimate in culinary experiences, Montpelier’s Mill Privée is a wonderfully atmospheric one-of-a-kind restaurant evoking the island’s rich heritage and storied past. Transformed into an intimate fine dining venue, Mill Privée is housed inside the plantation’s intact 300-year-old sugar mill and features original hand-cut round stonewall. Settle in for the evening with executive chef Cristian Bassi’s five-course tasting dinner. On the daily-changing menu, expertly aged and seared beef with braised ginger lettuce and soy just may be one of the courses, or pan-seared turbot and sautéed zucchini with lemon foam and mint-chile sauce. Desserts are always outstanding, including a chocolate tart consisting of richly layered bittersweet chocolate ganache and velvety caramel on buttery, crisp pastry with a barely detectable hint of sea salt. A juicy wedge of locally grown pineapple, grilled until tender and caramelized with rum, is the ideal partner for this sweet treat indulgence. Via direct, seasonal flight to St. Kitts, followed by a 10-minute ferry or water taxi ride.